Michael Dourson, whose Senate confirmation hearing could come as soon as next week, was DuPont's go-to guy when it needed a scientist to defend the compound, which has been linked to cancer; hormone disruption; and harm to the immune system, liver, fetal growth and child development. Most infamously, PFOA was responsible for widespread drinking water contamination and a resulting health crisis near DuPont’s factory in West Virginia. 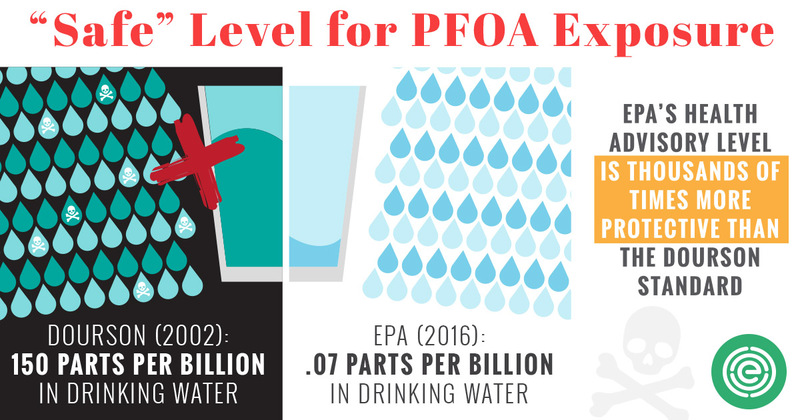 Because of its widespread use for decades in hundreds of consumer products and industrial applications, today PFOA and other compounds in the family of chemicals known as PFCs contaminate tap water supplies for millions of Americans from Maine to California. As PFOA pollution in the mid-Ohio River Valley came to light in the early 2000s, West Virginia contracted with Dourson’s science-for-hire consulting firm, Toxicology Excellence for Risk Assessment, to determine a safe level for PFOA in drinking water. West Virginia hired TERA, but the work was done with a consent order imposed on DuPont, and the company had recommended TERA to the state. Orders of magnitude less protective than any health guideline adopted by any state or government body since 2002. DuPont’s recommendation and TERA’s blessing of a weak PFOA standard paid off for the company. West Virginia adopted Dourson’s findings and set a safety threshold of 150 parts per billion for drinking water from 2002 to 2006, which, as reported by Sharon Lerner of The Intercept, limited the number of people near the plant DuPont was required to provide with safe drinking water. DuPont was also able to point to TERA’s study as part of its defense in various lawsuits brought against the company as a result of the contamination. Although Dourson’s work on PFOA in West Virginia is now 15 years old, PFOA contamination remains a very serious issue. In February, DuPont reached a settlement to pay $670 million to resolve 3,550 lawsuits by citizens of West Virginia and Ohio sickened by PFOA. Although PFOA was phased out in 2015, its extraordinary persistence means it'll be a problem for decades to come. According to EWG's Tap Water Database, PFOA contaminates drinking water supplies for more than 7.5 million people in 27 states. Also in 2015, residents of Hoosick Falls, N.Y., and Bennington, Vt., discovered unsafe levels of PFOA in their drinking water. Residents were ordered not to drink it unless levels were at least 1,500 times lower than the level Dourson endorsed as safe. In July, the nearby plastics plant responsible for the contamination was added to the federal Superfund list as one of the most severely contaminated toxic waste sites in the nation. The same year, DuPont spun off its manufacture of PFC chemicals to a new company called Chemours. The company is under investigation by state and federal regulators for discharging GenX, a PFOA substitute, into drinking water in North Carolina. And Chemours just admitted that PFOA persists in groundwater near its North Carolina plant. The EPA office Dourson is nominated to head will be responsible for assessing and regulating toxic substances like PFOA and GenX. His history with Teflon, and dozens of other chemicals, shows that he’s the wrong person for the job.